Nicolai Tanev started to play guitar when he was sixteen, but his real progress began after his meeting with the most famous Bulgarian classical guitar teacher Dimiter Deutschinoff, who nowadays teaches at New Bulgarian University. In 1990 the Bulgarian Ministry of Culture issued Mr. Tanev certificate which gives him the right to perform as a stage artist and in 1995 he got his certificate for guitar teacher. 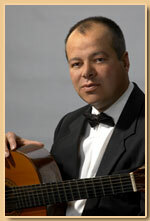 For many years he has been working as a classical guitar teacher. Meantime he played many clubs and restaurants in Sofia, including “Khan”, “Passport club”, “Stateside Cafe Americana”, “Toucan Bluzz’n rock” and many more. In 1997 the musical company “Riva Sound” released Mr. Tanev first solo guitar album – “Cocoa Beans” – Brazilian guitar music / RS 0267. The album includes instrumental compositions by the prominent Brazilian composer A. Carlos Jobim, L.Almeida and “Cocoa Beans” – a bossa nova written by Mr. Nicolai Tanev. This is the first album of Brazilian guitar music ever released in Bulgaria and had many positive reviews in the professional magazines, especially in “New Rhytm” – the biggest Bulgarian music magazine. The concert promotion was in the prestigious Hall # 9 of the National Palace of Culture (NDK). In the year of 2000, Mr. Tanev has been invited by the Bulgarian embassy in Spain to perform in Casa de Cantabria – Madrid, during an exhibition. He is also often invited to perform at private parties in the Brazilian Residence, the American Residence and in the Belgium Residence in Sofia. He also plays the blues with the harmonica player Alexander Donchev in a duo called “Guitar Nick & Blue Al”. Their first appearance was in the documentary “I have an idea” by the famous director Ilian Simeonov (“Frontier”), produced by Blago Nikolic. The film was nominated and has won the Special Prize at the International Film fest “Zlatna Rakla” in Plovdiv, Bulgaria (1998) and the Special Prize at the International Film Fest “Zolotoy Vityaz” in Russia (1998). In 2003 Mr. Tanev released in cooperation with the company “Riva Sound” his second recording – a blues project of Guitar Nick & Blue Al, called “Tribute to Robert Johnson”. The CD was dedicated to the great American bluesman Robert Johnson. The release was sponsored by Sandvik – Bulgaria, Saab – Bulgaria, Hip Com Ltd and some other lesser known firms and broadcast with the support of media partners Bulgarian National Radio (program Hristo Botev), jazz FM radio, RFI (Radio France International). The concert promotion was in Stateside Cafe Americana, the real home of the American music in Sofia. The album was broadcast by several radio stations in Bulgaria, Spain, Germany, Denmark, Poland, Norway, and even USA. Among the reviews about it more interesting are those of Mr. Ivailo Kitsov, editor in chief of the ‘Rhytm” music magazine and Mr. Bruce Iglaner, president of the biggest blues label in the world “Alligator Records”, who wrote in a private letter to Mr. Tanev: “ On the whole, this was a very enjoyable album. You are both fine players and very restrained. The best I can do is giving my sincere compliments on a fine record and encourage you to continue.” The group played in stateside Cafe Americana from year of 2000 till its closing in 2004. Nowadays the group continue to play in “Toucan Bluzz and Rock” and some other clubs. The group also has taken part in all the editions of Sofia Blues Festival. In 2004 Mr. Nicolai Tanev wrote and performed on guitar the music for the documentary “Reconstruction”- (director Vladimir Angelov). The film was broadcasted by the Bulgarian National Television, the National satellite channel and was nominated for the international festivals”Zlatna Rakla’ and “Zlaten Riton”, where it has been nominated for the prize of the critics. Mr. Tanev also wrote music for classical guitar, which he annually presents to the International Classical Guitar Composition Competition “Andres Segovia” in Spain. His last entry was in a composition competition in ISC (International Songwriting competition) in Tennessee, USA - 2005, where his composition “Sofia Blues” from the album “Tribute to Robert Johnson” got to the second round of judgment in competition with 15000 other songs. In 2007 “Sofia Blues”won the Runner-Up Award of IAMA ( International Acoustic Music Awards) in Florida, U.S.A. The same year he received the status of Alien of Extraordinary Ability and moved to Atlanta, GA where he quickly became one of the most sought-after wedding and party classical guitarists.He has been working for the YPO, UGA, The Girl-Scouts and the Atlanta Opera among others. He’s been teaching guitar at Draisen-Edwards Music School in Marietta, GA for two years and a half. In 2008 he recorded the CD „ Latin ‘Scapes” – latin-american duets with the flutist Teresa Lemaire. Now Mr. Nicolai Tanev is a free-lance musician and guitar teacher.